Seriously, y’all. This stuff is amazing! Absolutely Amazing. It feeds a crowd too, so it’s great for company. My parents always join us Christmas morning to check out the loot that Santa left, so it’s a great easy way to fill a bunch of folks. 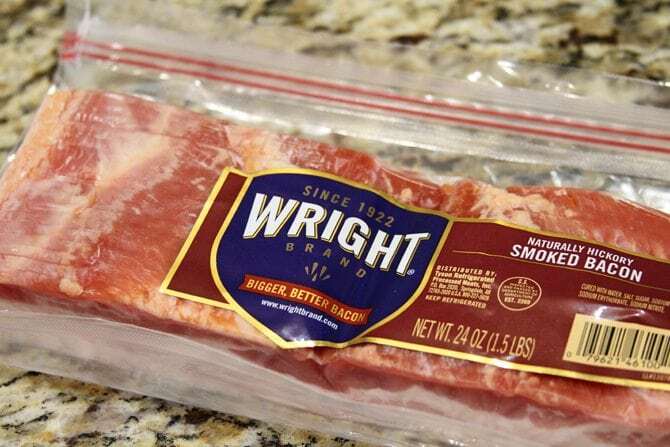 Start by cooking 10 strips of bacon to crisp, then drain well on some paper towels. Then chop the bacon coarsely. 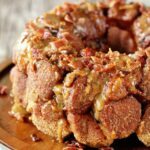 You can even cook and chop your bacon the day before to give you a head start on Christmas morning. 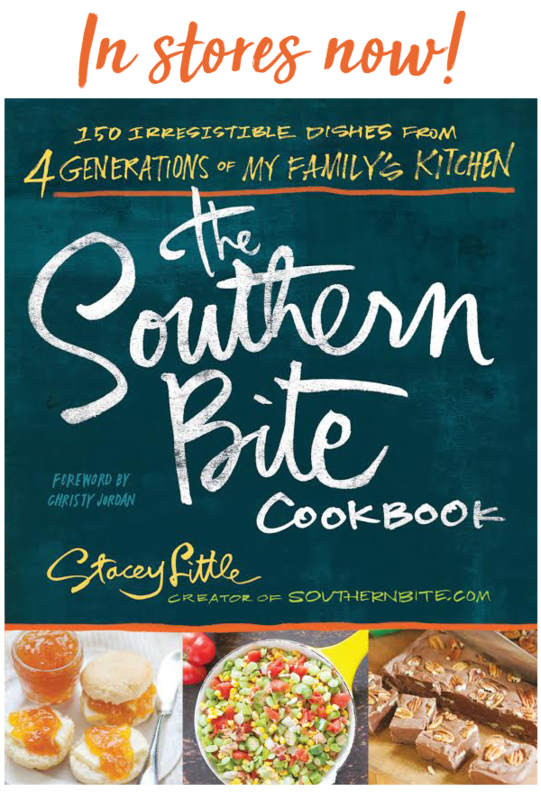 Next, open your canned biscuits and separate them. 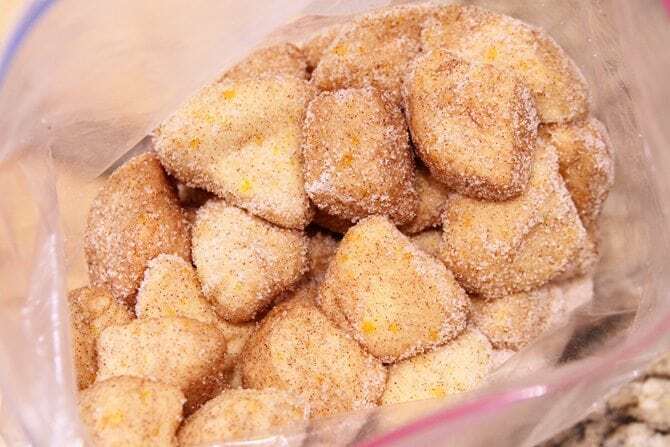 Cut each biscuit into quarters. Open up a gallon-size zip top bag and combine the white sugar and cinnamon. Place the biscuit pieces in the bag and seal the top. Shake it well, making sure to coat all the pieces in the cinnamon sugar. 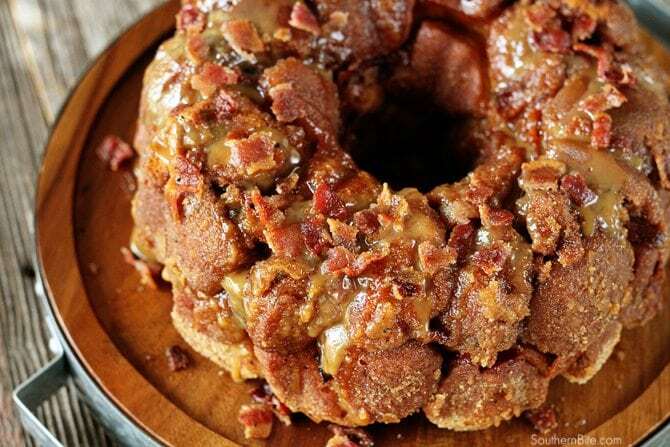 Coat a Bundt pan with nonstick cooking spray and layer the biscuits and crumbled bacon into the pan alternately. 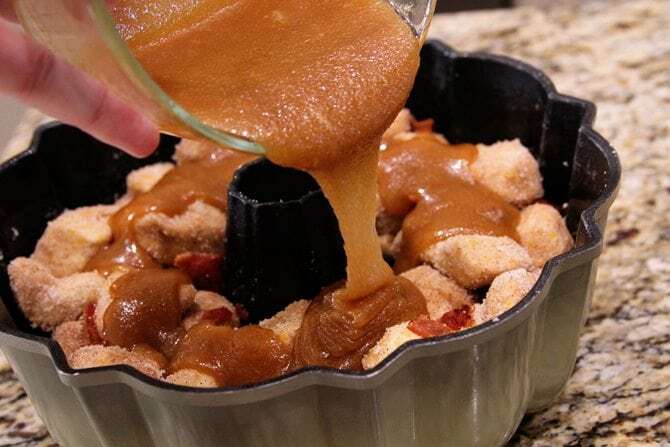 Combine the melted butter, brown sugar, and salt and mix VERY well to get it all combined. (This may take a few minutes – don’t give up). Pour the mixture over the biscuits, then bake uncovered for 50 to 55 minutes, or until the bread is deep golden brown and done throughout. You can check doneness by using a butter knife to separate a few pieces down in the middle to make sure they’re cooked through. Allow the bread to cool in the pan for 5 to 10 minutes, then place a platter over the top and invert it. If you’ve sprayed the pan well enough, it should just slide right out. Now the best part… EAT IT! 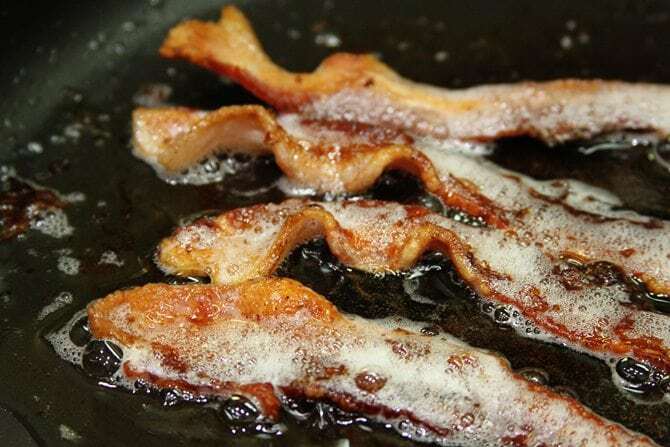 Preheat the oven to 350° F. Cook the bacon over medium low heat to crisp and drain it on paper towels. 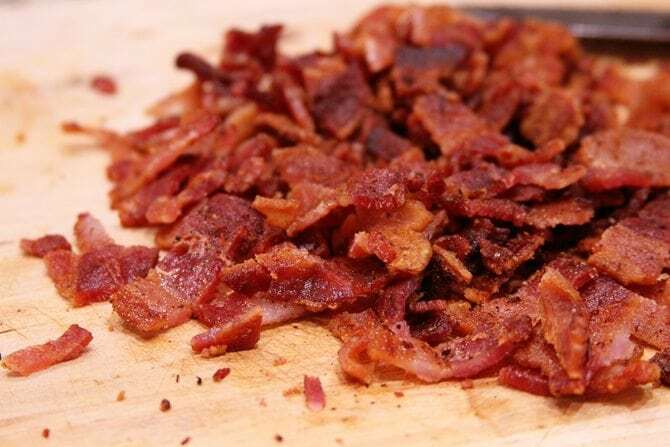 Coarsely chop the bacon and set aside. 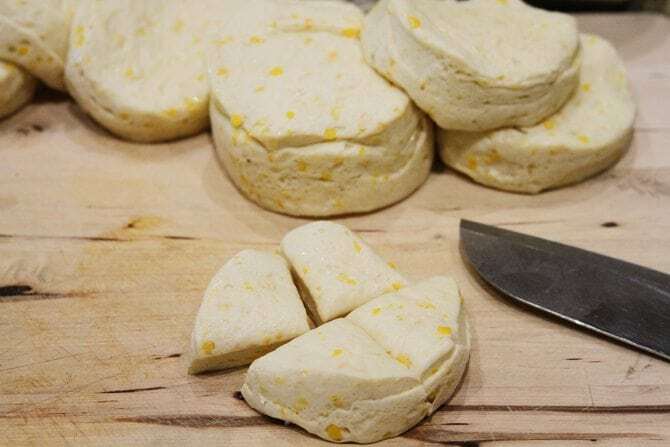 Open the biscuits and cut each biscuit into quarters. In a gallon-size zip-top bag, combine the white sugar and cinnamon and mix well. Add the biscuit pieces and close the bag. 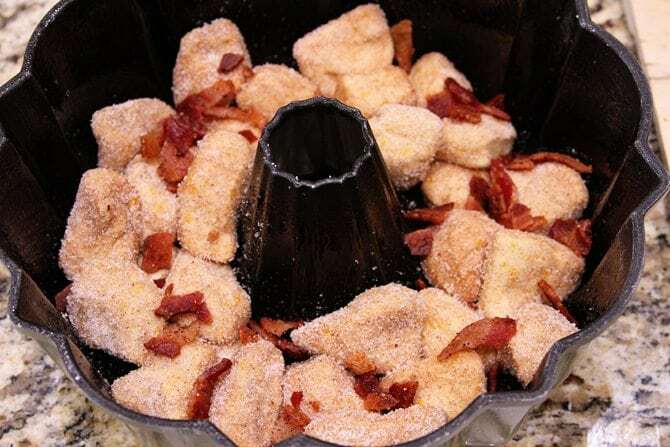 Toss the biscuits pieces to coat them in the cinnamon sugar. 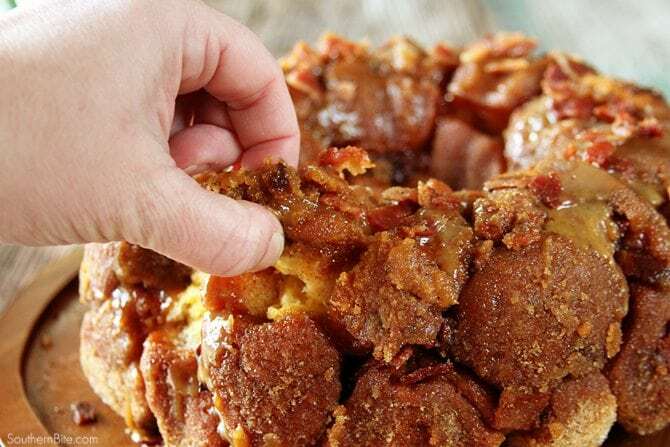 Spray a Bundt cake pan with nonstick cooking spray, then layer the biscuits pieces and bacon in the pan. 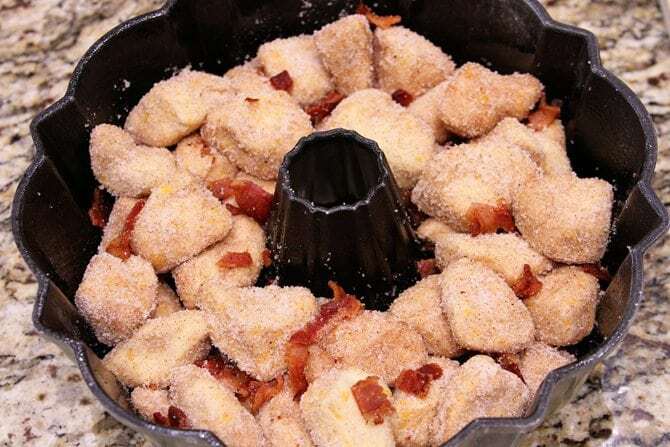 Combine the melted butter, brown sugar, and salt and mix well. This may take some effort, but they will eventually mix together. Pour the mixture over the biscuits and bake for 50 to 55 minutes or until deep golden brown and cooked through. Cool in the pan for 5 to 10 minutes, then place a platter over the pan and invert. Serve warm. 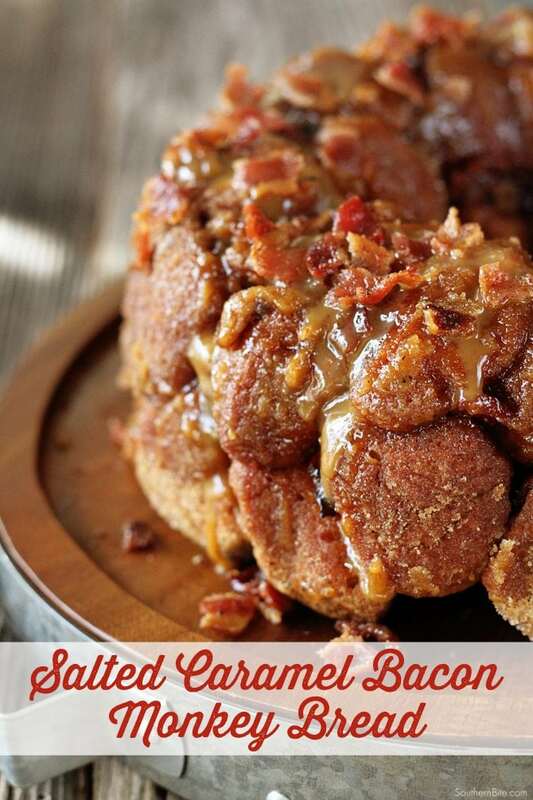 Sweet and salty…and pull apart! Those are a few of my favorite things! Stacy, stahhhhppppp it with this right now! 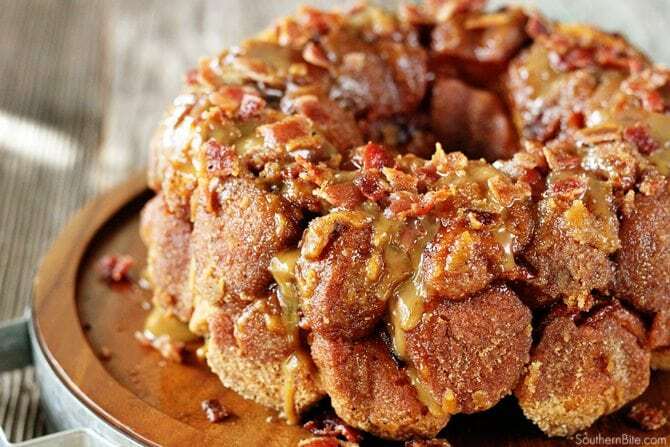 Salted caramel AND bacon AND monkey bread? Um, yes. Yes please. Oh! So delicious! What a wonderful combination. 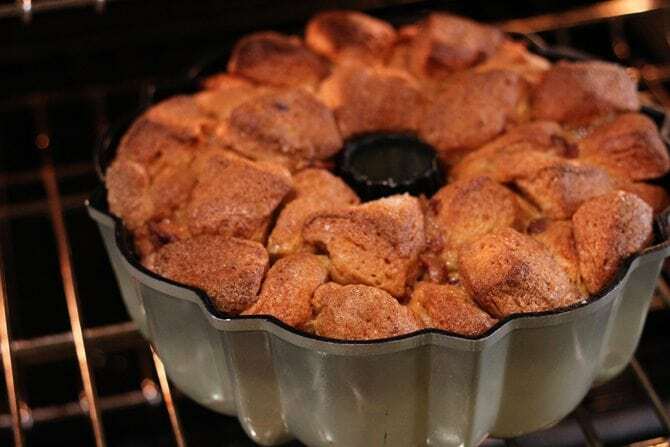 I love to make monkey bread on Christmas morning. This will become our new tradition! Yum! No, there’s no mention of cooking the brown sugar mixture. You just mix it all together. Hope you enjoy!! Mine started to burn, is it ok that I payed a sheet of foil over it? Could you use Rhodes freezer rolls for this? 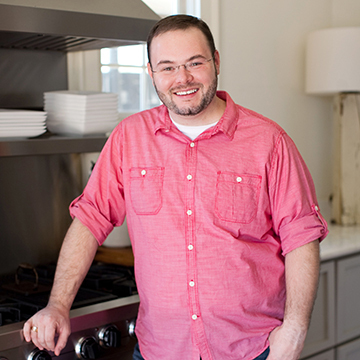 I’ve seen plenty of recipes that use them, but I haven’t done this one that way.